As much hate as services like Yelp get, it's hard to deny that they're online reviews are useful at times. Sure, Yelp strong-arms businesses into joining their platform when they don't want to, and there have been scandals of local businesses paying people for positive reviews. However, it doesn't change the fact that I've found some honestly amazing spots just using Yelp and Google Reviews. Stars aren't everything, either — it takes a bit of digging into the 5-star and 1-star reviews to see if people's concerns about the joint are legitimate or if someone is just upset that their waitress or waiter wasn't flirting back at them, or they felt like they didn't want to pay for a meal after they finished eating the entire thing. 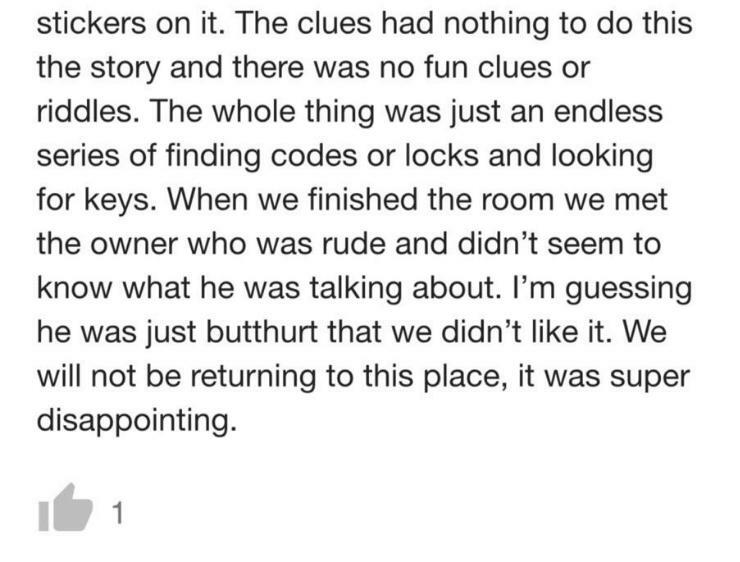 Or, as is the case with this escape room, when the reviewer was a destructive customer who almost burnt the joint down. The wonderful thing about these platforms is that the owners of these fine establishments can get a word in edgewise and respond to whatever gripe the person had. Sometimes, it's clear the owner is a psychopath; other times, we see that the customer's in the wrong. In this particular instance, it looks like the owner's had the upper hand. 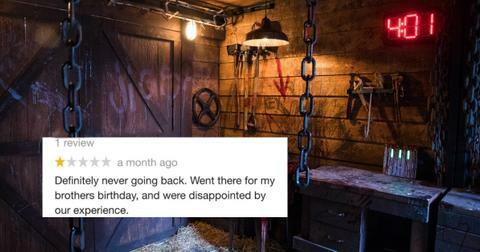 The customer started flapping their gums on Google reviews by giving this account of his "poor" experience at an escape room. From the customer's review, it's pretty clear that they weren't too keen on "playing by the rules." They thought that the "dumb red stickers," which are probably present to prevent accidents (pretty standard if you've been to an escape room), were a nuisance that ruined the entire experience. 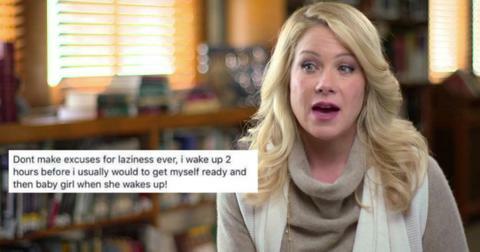 Things didn't get much better as the review continued. 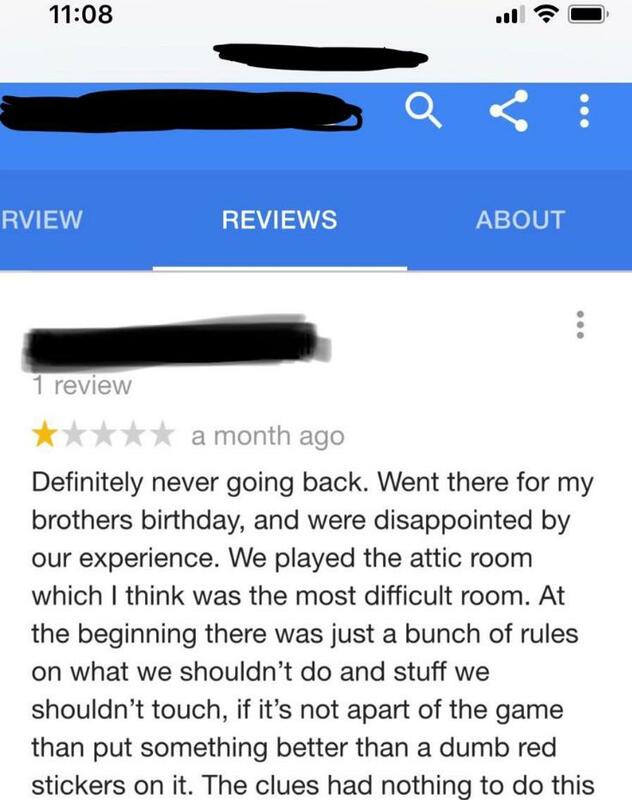 The reviewer ends their extremely detailed and very thoughtful review by accusing the escape room's owner as being "butthurt" that his group didn't have a good time. As it turns out, however, they were more butthurt by the fact that this customer tried to mess with the wiring in the escape room and attempted all sorts of "out of the box" ideas that were borderline insane. The owner is all polite savagery with their response. They clearly mentioned that they listed the do's and don'ts of the establishment, but mentioned that they were floored because they didn't think they needed to tell participants that potentially setting the building on fire would be a bad idea. Then they gave the skinny on just how insistent this group was on disobeying the rules — not to mention putting themselves and the people who worked there in danger. 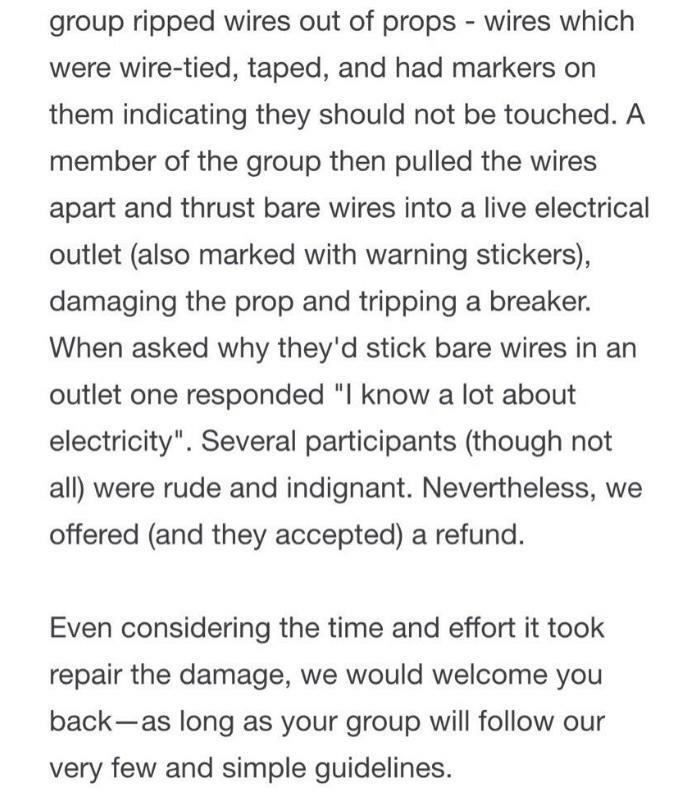 Despite the fact that a member of the group ripped wires out from the wall, then plugged those exposed wires into an electrical socket to try and "hack" the room or "trip" something, they were still offered a full refund (which they accepted) rather than being asked to foot the bill for the damages that they caused. 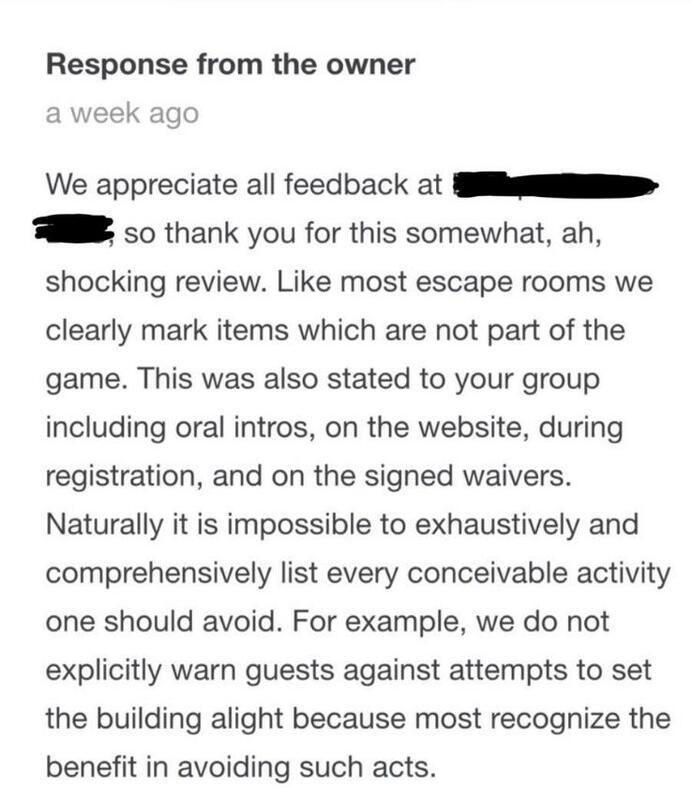 The owner was quick to point all of this out and still welcomed back the destructive customer, that is, if they were willing to follow all of the guidelines of the escape room. The internet's full of wonderful one star reviews and clap backs. 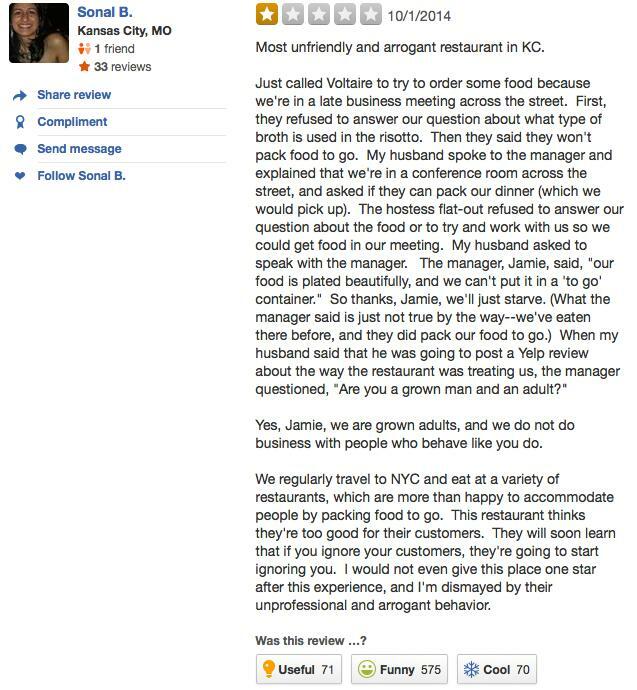 This Yelp-classic jibe against Voltaire, an exquisite eating establishment in Kansas City, features an irate customer who wanted their food to go and was upset when the person on the phone didn't know what kind of broth was used in a soup off the top of their head. 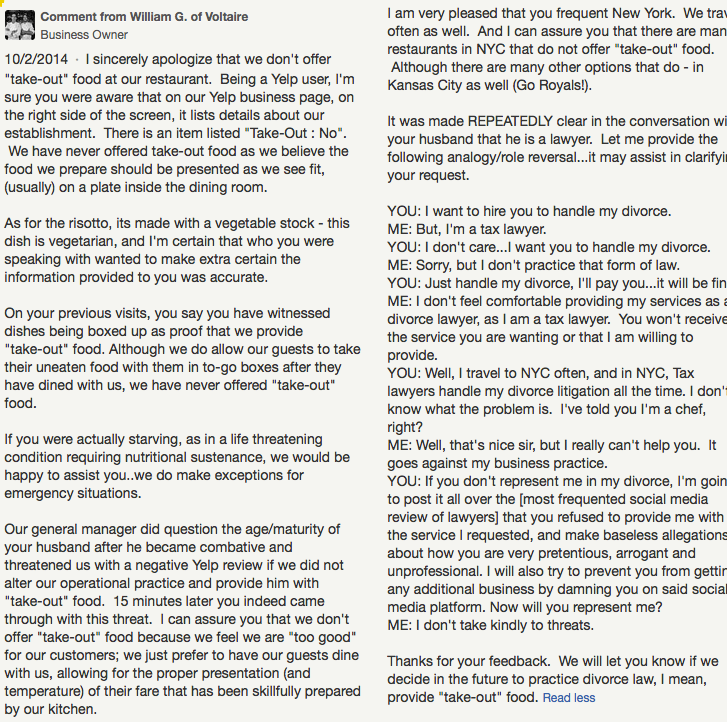 A member of the Voltaire team, Chef Jamie, responded point-by-point why the customer is wrong. I'd argue that Jamie shouldn't even have taken the time to rebut the customer's claims, but hey, the man's passionate about his work and restaurant. 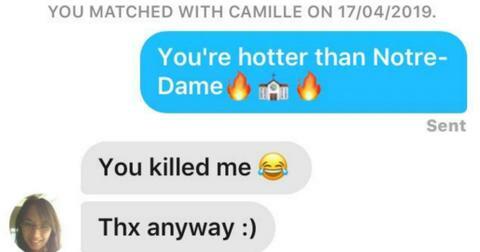 Can you fault him? 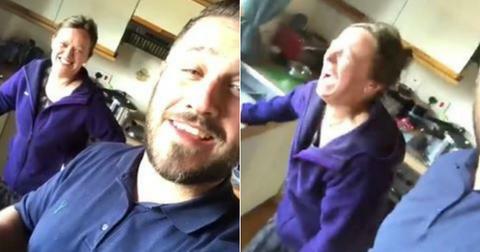 At least she didn't try burning the restaurant down by re-wiring the kitchen or messing with the gas lines. Yeesh.